Steven Gerrard has boldly admitted what most fans think and say to each other, and have wished the club would say too: that Scottish football is looking to bring Rangers down every chance it gets. If ever a brief few words summed up a general sense that fans have, this is it. It is absolutely true – Rangers remain the team everyone wants to bring down, to topple, to get results against. Celtic might be the top team in the land (well, until recently) but it’s Rangers that opposition fans hate that bit more, and want to see crushed at all times. 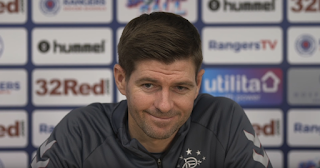 No other team in Scotland has ever been subject to the vitriolic hate Rangers are, and for Gerrard, a previous outsider, to be able to see this plain as day rather sums up just what Rangers put up with. The treatment of Rangers by the Scottish media is staggeringly different to how the English press views us, and that sense of targeting is so obvious that even a man half a year in the job can see it. Everyone knocks us. We don’t care. We don’t care allegedly,however since the travails of 2012 we are always talking about how nobody likes us. If we didn’t care we wouldn’t mention it .